Every once in a while I get comments from posts many years in the past that are usually spam marketing promotions. I usually delete the spam comments when my notifications alert me they have arrived. However on 2/15/15 I received a comment from a person identifying himself as tarek smith (probably a pseudonym) to the March 10, 2011 post entitled “What Might Happen to Libya’s Weapons Cache?” on my NCCR blog. 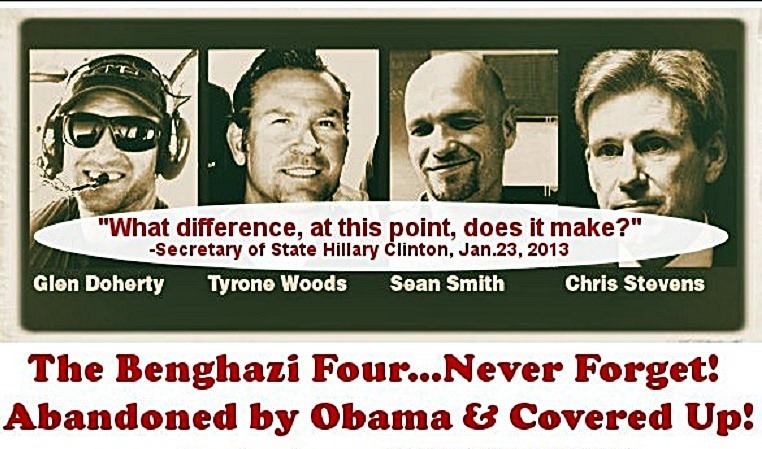 In looking back at the 2011 post I realized that the thoughts were a precursor to the eventual Benghazi slaughter of Ambassador Christopher Stevens, State Information Officer Sean Smith, and Navy Seals Glen Doherty and Tyrone S. Woods. As the title suggests the relatively short post based on a STRATFOR analysis involved wondering what happened to Muammar Gaddafi’s weapons cache after the various Libyan rebel militias managed enough unity to defeat and execute old the Muslim dictator/supporter of anti-Israel/anti-American terrorism. Keep in mind this is before the Benghazigate suspicions that Obama was illegally sending that weapons cache to Syrian rebels fighting Bashar Assad. If that is indeed what happened to the weapons cache it is likely that much of those weapons fell into the hands of al Qaeda supported Jabhat al-Nusra (JN – 12/2014 PDF) or ISIS terrorists as well (See Also HERE). Tareq’s comment is translated by Google Translate from Arabic text. Go to the NCCR comment with the date-link below to view that Arabic text. Google Translate’s translation is in rather broken English. If one has a better translation feel free to post it in the comment section. Some of the words Google couldn’t figure out are in transliterated English text. The reason the comment piqued my interest, after I took the time to try to decipher it, is that Tarek seems to be calling on all good Muslim bros to unite against the Radical Islamists inserting politics as much as the Islamic religion. Or if my guess is incorrect Tarek may be calling the government the West seems to be supporting a treasonous entity and to support the Islamists. From the links I looked at below, it seems the West is supporting the government located in Tobruk while the more radical Islamic militias are supporting a government established in Tripoli. If you have read my past posts you probably realize I am what Leftists and Muslim apologists would label an Islamophobe. The reason for that is I am just down right against anything Islamic. Islam is Islam rather it is radical or the so-called moderate. Both so-called camps view the Quran as absolute truth and place a lot of stock in the Hadith and Sira which are not quite as absolute as a the Quran but many Muslims to one degree or the other find quite authoritative. Due to this Muslim love for their Islamic revered writings (NOT holy to me) Islam is an evil religion vis-à-vis Christianity or Judaism for that matter. The Quran specifically denigrates the Divinity of the Lord Jesus Christ, rejects the Crucifixion, rejects the essential Resurrection that Christians believe can restore humanity to God Almighty and reject Christian mainstay orthodoxy such as the Trinity – Father, Son and Holy Spirit are ONE God expressed in three persons. The Quran twists and fabricates the Holy Scripture of the Old Testament (Jewish Tanakh and thus the first five books of Moses Christians call the Pentateuch and Jews call the Torah) AND the New Testament. This Quran twisting and fabricating eliminates Islam as part of the Abrahamic religions (as far as I’m concerned) and only leaves Judeo-Christianity. If that makes me an Islamophobe I embrace the term. I just don’t embrace the literal meaning of the term which would go something like an unnatural fear of Islam. I don’t have an unnatural fear, rather I have a theological loathing of Islam. Even as much as I loathe Islam I work very hard to take a ‘What Would Jesus Do?’ (WWJD) mentality toward that theopolitical ideology. Most of the time I am successful with WWJD but admittedly there are moments that the loathing steps over the line. God have mercy on me. Appeal to Libya rebels honorable particularly followers of the National Conference and the Islamists all year in Libya. Dear brothers in Libya – rebels nationalists and Islamists in Libya united, united, united for the sake of Libya before it is too late. The enemies of Libya on the doors and start laying the fingers of the Arab betrayal of eastern Libya and customers from inside Libya and guest resort also is not clean is Daafairse- if Daash [Blog Editor: or Daesh – pejorative name for ISIS, ISIL, IS (Islamic State)] Libya accepted work Under the leadership of the rebels in Libya. Welcome if they refused the leadership of Libya rebels and the legitimate Libyan Amthelh b Libyan National Congress [Blog Editor: Apparently Libya currently has rival governments] must get rid of them quickly before Etjzrua and Imitdoa in Libya. Where these Islamic[s] their appearance can accept sometimes between the good people of the principle of Islam is one, has always been recognized help to his brother Muslim but matter [of] fact is mixing between politics and religion, and the entry of the wicked intelligence Alognih guise of religion through the intercalation of religion and an introduction to some of the good people seducer [Blog Editor: Perhaps “seducing”] them and pushed them to the forefront of polishing the scene and behind them the bad guys managing general framework and funding from suspicious sources of intelligence – foreign with traitors customers in the Libyan interior. [These] taking advantage of the good people, the truth is decent title for this; Right is intended to Batal. So who wants to help the rebels brothers in Libya Islamists and Qumien– seek for the good of Libya and the future of the people. Alliba- must accept the Libyan administration hundred b percent people of Mecca know Bashaabha? Those who refuse to work under the leadership of the Libyan National Congress in the interest of Libya urgent and necessary to Shooting outside Libya violently because [of] the enemy and holds a foreign agenda pose the greatest threat to the existence of Libya and its people unabated or Takhir. [0kl – Blog Editor: I have no good guess for “0kl”] anything away from the leadership conference seeks to work outside the system under the National Libyan leadership, the leadership of General National Congress, which emerged from the largest segment of the Libyan people. Otherwise should be classified as an enemy of Libya and its people, whatever the gloss image and logo is, an enemy of Libya must Dhardhm outside the border and rehabilitation of Taban seducer of their people Alliba0erjoa guidance and reconciled to Msthakaha.